The Angelina, which was launched to much acclaim at October’s ACOS event at London’s Olympia, is rapidly becoming the jukebox of choice, with Amusement Leisure, one of the North West’s leading independent operators, the latest to confirm a 25 unit order for what many observers regard as the world’s leading jukebox. Owned and managed by the inimitable Paul Purcell, Amusement Leisure takes great pride in being an independent, market-leading business that provides a truly personal service to hundreds of sites across the region from its base in Warrington. The Angelina combines outstanding visual appeal with Playdium’s proven interface and a new modular system with snap in parts which make servicing simple and straightforward. Offering access to over one million tracks the core objective is to drive cash box and TouchTunes has succeeded in once again raising the bar in a mission to deliver the very best jukebox in the world. The Angelina can be delivered within a week enabling operators to start making money from day one. 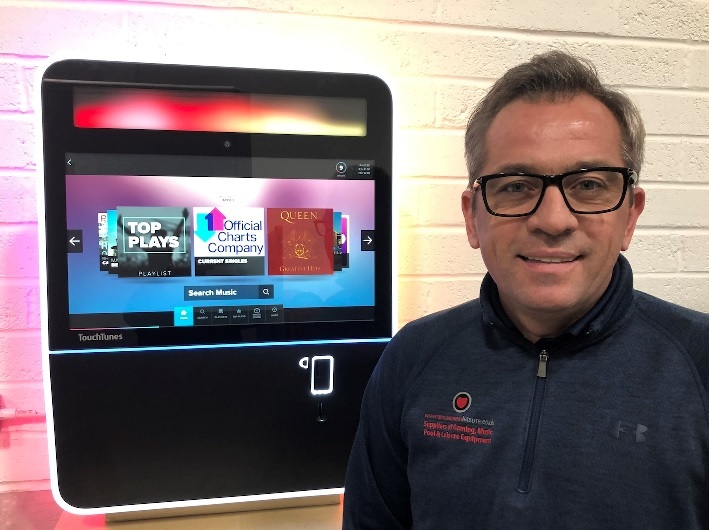 As part of its commitment to UK operators, TouchTunes is making the Angelina available either on a fixed fee or using the orthodox 18 percent of cash box. The fixed weekly fee of £13.85 per week, means the Angelina is available at better terms than the V-Hub which was launched in 2011.